And, ladies and gentlemen, it’s official! 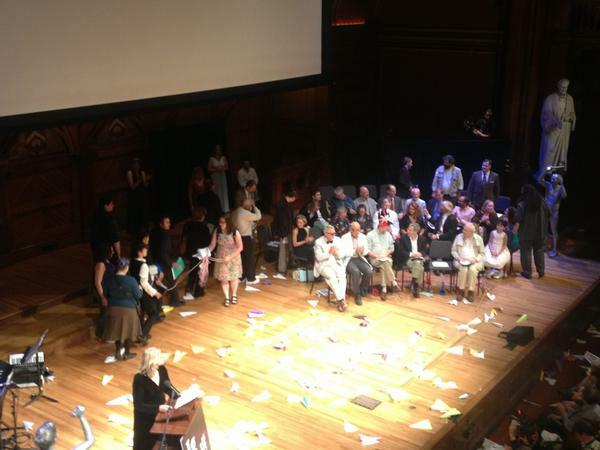 The winner’s of this year’s IgNobel prizes have been announced and the webcast of the ceremony showed it to be as good-natured and cheerful an event as ever. Literature: the U.S Government General Accountability Office for producing a report about reports about reports that recommends the preparation of a report about the report about reports about reports. For real. Peace: Petrov for converting old military explosives into nanodiamonds which can later be used as light beacons for cancer treatments such as chemo. Lest anyone think this is being taken too seriously, the awards also featured two 30 second periods during which people were officially allowed to throw paper aeroplanes onto stage (accompanied by cries of ‘safety first! !’), with some brave soul standing thereon and wearing a bullseye. More details about the prize winners and their inspiration can be seen in articles from The Guardian and the Washington Post. One of my favourite elements, apart from the oft-shouted ‘Please stop! I’m bored’ chorus of this year’s _two_ Miss Sweetie Poos, is the 24/7 lectures. In these, a top researcher is asked to explain their subject twice: first, a completel technical description in 24 seconds (they very seldom get to complete their abstract). And second, a clear summary, understandable by anyone, in just seven words. Mass spectrometry? “It weighs the bits in your junk”. The research last year about bacteria living on arsenic? “Only arseholes believe arsenic can support life”. Why the universe keeps us enrapt? “Because it’s the only one we’ve got”. The IgNobels 2012 live! Now! * The link points to the New Scientist article about it because the paper itself is behind a paywall, and costs $113 US PLUS TAX!!! !